LD: How did you get started playing the autoharp and the dulcimer? LD: When you were a kid, what did you want to be when you grew up? (laughs) I had no idea! I was really into art. I was thinking about visual arts, but I did well academically too. I didn’t see myself being a professional musician. I loved music more than anything, but I didn’t want to pursue the classical arena. I had really intense classical piano studies until I was about 15 and then I was ready to take a break. I picked up the classical guitar just as intensely. Once I picked up the strings, I really felt more in touch with that than with the piano. To pursue music at college would have required I go to the conservatory and take the classical route and I was just done with that. I didn’t see a career as a folk musician being a viable option. That career just had to gradually develop over time. When I was in college at the University of Kansas I tried to meet other musicians in the community even though I was studying all the time. I met some people that I played with regularly and we formed a band. When I graduated, I thought I would take that proverbial year off and decide whether to pursue grad school and in what discipline (I was in Art History and English, with a minor in Fine Arts and had done journalism too). So I took a year off and got a job with a jewelry maker doing really high-end gold and silver smithing and still played pretty seriously with my band from college. I also got a Celtic band going. Both bands rehearsed twice a week, and gigged on the weekends, so I learned the craft of being in a working band: the playing as well as the administrative end of it. Meanwhile I still had the security of a full time job. I was earning more with the band than I was with the full time job so I just kept going with that. When I moved to Minneapolis, I hooked up with a music school and music store to give lessons and still did temping and office work while I was building up my student base. I started touring more as a solo artist, was quickly playing in 4 bands, and then gradually I realized that I had enough students that I didn’t have to do the other stuff. I had no illusions that it was going to be easy or that it was going to happen because I said it was going to happen. It really was a day-by-day thing. I get a lot of calls now inviting me to events, so I don’t have to do the same kind of outreach anymore. And your network of contacts keeps spreading so you get more ideas of where and how to set up things over time. LD: If you could collaborate with a musician living or dead, who would it be? I’ve covered songs by Sting, and now he is playing the lute too. That would be a trip! I would add Maybelle Carter, Eliza Gilkyson, and the Swedish band Väsen to that list too. LD: When you talk about your music or pull out your autoharp in public, and someone asks “what is that?” What do you tell them? What’s your short answer to the question… like at a dinner party. It depends on whether I am going to have an opportunity to play for them. If I can play something for them, I will probably do that before describing it. 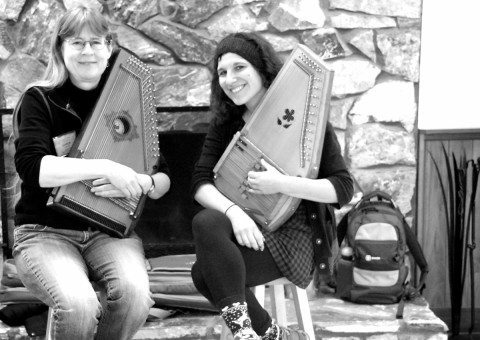 But first I usually need to say “it’s not a harpsichord,” because people get those words mixed up – autoharp and harpsichord. I also say “It has 36 strings, and I play it like finger-style guitar.” That is usually a good point of reference for people. LD: What about your dulcimer? That’s a little trickier because of its dronal quality. The dulcimer sounds almost ancient. I’ll say it’s an Appalachian instrument played flat on the lap, that it has a rich history, and is also used in innovative ways. 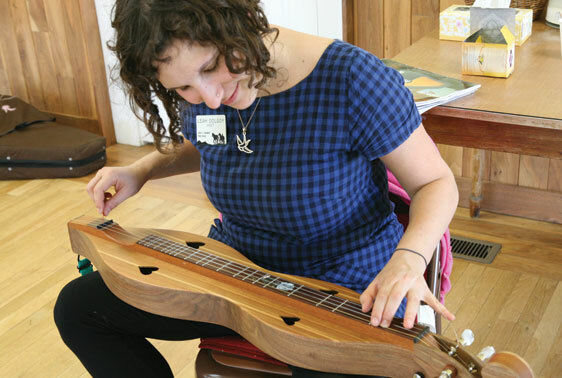 Outside of the southern U.S., people are much less familiar with dulcimers. Some of my best moments have been getting to play with people who I really really admire. Tony Trischka – banjo player, Liz Carroll – Irish fiddler, that time I got to jam with John Paul Jones from Led Zeppelin. Also one of my heroes is the mandolin player Mike Marshall. I got to play with him once in England. The thing is not so much their names, it’s that these musicians are a sheer force of nature. Their absolute talent just pushes you to another level. To be able to hold on and ride with that is so exciting. LD: You have a career that is built around teaching. I imagine that must try your patience from time to time. How do you stay motivated and engaged? If I am having a moment of being frustrated, it’s usually in a situation with an individual as much as with a group. And so I try to see what that individual is really needing and what is or isn’t being said. Instead of approaching it as wishing that the student would do something differently, I try to think of what the student needs and try to go with that. Teaching beginners is also really exciting. 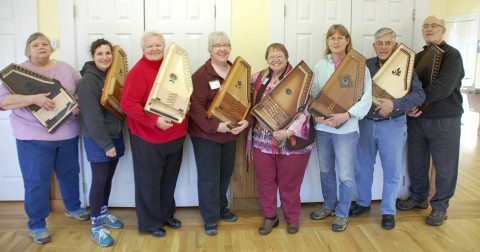 These beginning dulcimer players came this weekend and four of them had never played, and they didn’t know if they’d be able to. You are going from 0-50 in a matter of hours and it’s so cool to see their excitement when they realize that they can do it. It’s a whole other experience from taking someone from one level to another. This is from nothing to something, and that is pretty amazing. LD: Good teachers are special people – especially those teachers who taught you a skill that you use. Those individuals make a huge lasting impact on your life. To me, the most effective teaching experience is if the teacher is really able to take you from just where you are, without expectations, to where you want to go, which you might not have even known before. Both of my parents were teachers so there was an expectation on my part that this was something I could do. I decided not to pursue that path and get an education degree, but it must be genetic. I started giving guitar lessons in high school and discovered I liked it and was pretty good at it. I had to find my own way to do that, to teach, and it wasn’t going to be in a regular classroom. I have gone back and taken some education classes because I now do some teaching with classroom students, and I do enjoy teaching music with younger kids. “Intermediate to Advanced Autoharp” Class at the Folk School, taught by Karen Mueller Jan 12-17, 2014. LD: What’s changed in the musical landscape of the instruments you play? 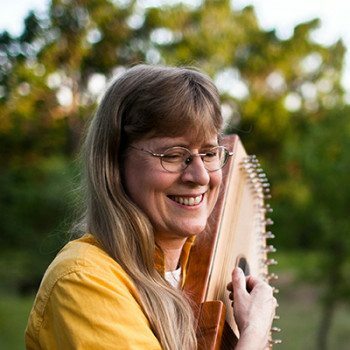 In the world of the autoharp and the dulcimer? I think more people are playing these instruments at a higher level. A lot of that is due to programs like the Folk School where people can go and really focus on their playing. It’s nice to see both instruments branching out into indie music and not being so confined to certain expectations. LD: I definitely feel like I am a part of that autoharp indie renaissance. Absolutely! It’s so great to see the instrument in wider use. You’re like a missionary for it! When I first moved to Minneapolis I would sit in with a couple of indie bands that opened for bigger acts like the Jayhawks in the ‘90s. Lately I’ve been more focused on traditional music, but still do recording sessions with singer-songwriters from time to time, and pursue playing whatever style of music I like. LD: Can you describe a disaster gig? (laughs) I can think of some. You can’t play for awhile and not have a few of those. One was with my Irish band back in Kansas. We were at an art fair. It was July and they had us playing in full sun which is kind of dodgy in itself. Your instruments are going out of tune and threatening to explode on you. There were some people sitting out on the hill side in full biker leathers and one guy had this really bad guitar that he was strumming as we were playing. We were playing traditional Irish music and he kept yelling “DO SOMETHING IRISH!! !” And we were like “Yeah, we are!” And then one of them yelled down “HEY, LENNY CAN PLAY FREEBIRD ON GUITAR. LET LENNY PLAY FREEBIRD WITH YOU!” You couldn’t pick anything more cliché. So we had these bikers heckling us, we were melting in the sun, and finally we just had to stop. It was a total disaster. LD: What is your advice to beginning musicians? What do you know now that you wish you would have known when you were getting started? There are really two things. Find the instrument that best allows you to express yourself. And then find others to connect with around that instrument and around music in general. In this type of music it’s easy to find a community. LD: What is your history with the Folk School and what is your relationship to JCCFS? This is my 4th time teaching here. 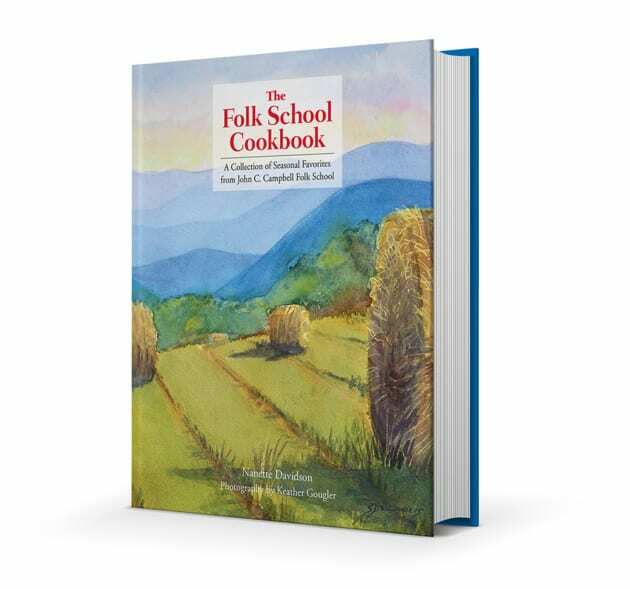 I have heard about the Folk School for a long time. 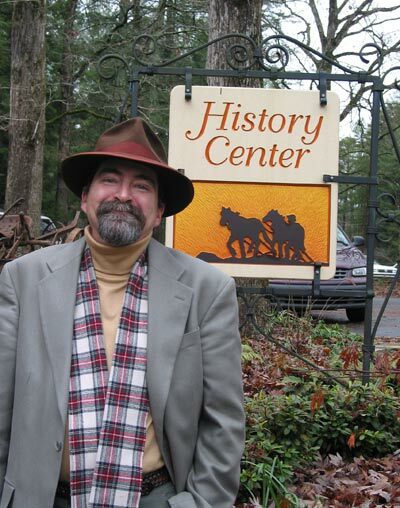 The first time I came was for Dulcimer Celebration in 2009. 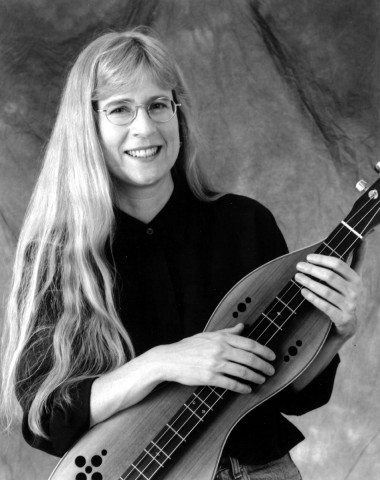 I’ve come back three times to teach my January autoharp and dulcimer classes. There are so many really cool things that I love about teaching here: the physical setting, the space, to be in nature, able to walk into the woods, to have clean air. Davidson Hall is my favorite space to teach in anywhere. I find the windows and the view puts the students at ease. In the autoharp class, I noticed after a few days that the students started tuning each morning facing the windows. The people who work here are fabulous. They are creative and intuitive, and fun to be around. The food is the best. I also love the autonomy as a teacher: you get your keys for the studio, you get your students, and you get to do whatever it takes to make the class work. LD: What’s next for you? What’s on the horizon of your musical career? I want to keep doing the things I do as far as teaching, travel, and performing. 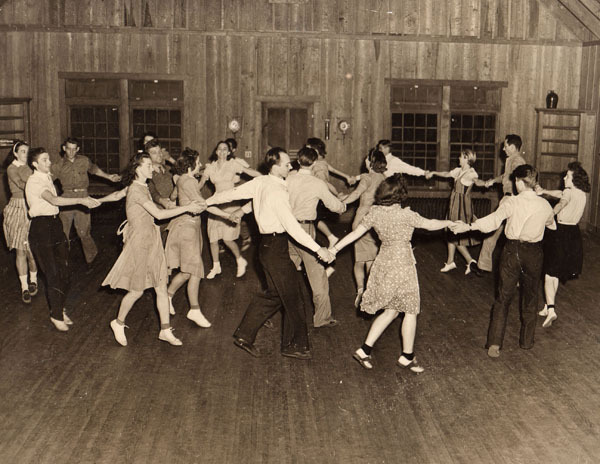 I have a busy tour schedule coming up this spring and summer, including returning to England to teach at their “Sore Fingers Week” for Europeans learning bluegrass and old time music. One thing I want to develop more is writing for autoharp with orchestra. I had an opportunity to do that last year and can really see some fun things that I could do with that. Now it’s time to break out your iPod. Inspired by my friends at Sealegs Collective in Halifax, Nova Scotia who run a column called Elevenseas, I am going to ask you to shuffle your iPod and tell me about the first few tracks that come up. Tim O’Brien! Yay! I can’t say I have a huge history with this song in particular but I remember when I got this album I just loved it. It was a great driving album as you can tell. This is the Irish harpist who plays with the Chieftans. This is an album that I really downloaded for referencing purposes. It’s ancient music for the Irish harp. Kilby! Of Course. I just got a massive 5 or 6 set of a Kilby Snow autoharp Anthology. I am not sure what song this is. It is just so live. He always sounds like he doesn’t have his teeth in. I first got a Kilby album about a year after I started playing. And it was amazing. Such authentic mountain music. Beach Boys! Oh dear (laughs). Sometimes you just need some Beach Boys. The harmonies are so good. They must have really worked on it. Oh so nice. Solas. I am re-discovering their second and third records. The first one came with me on a huge cross country road trip so that’s the one I know best. But I am trying to get back into the other records too. Oh – Gillian. She is really the best. This is off Revival – my favourite Gillian record. I can’t count how many times I have listened to this album. This must be off the same playlist as the Beach Boys. I am a child of the seventies. What can I say… soul and funk. I just loved it all. For the record… we went forward to see if there was anything embarrassing on Karen’s iPod. The results were: Joni Mitchell, more good Irish music, Elton John – nothing remotely unfashionable on this musician’s playlist. PreviousSpend Your Spring Break at the Folk School in March! Karen, so glad that you’ll be back to teach in January 2o15 and Leah, looking forward to who you choose to interview next! Karen, nice interview. I was so amazed by the hand-made dulcimer you and your dad made when you were in high school. How wonderful you have made a career out of your greatest love.